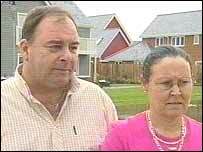 A Kent family on holiday in Portugal during Euro 2004 say they were beaten up by security guards and police. Michael and Tina Philips were staying at a beach club in the Algarve when they claim they were assaulted along with son Michael and his girlfriend. They say they were set upon as they returned to their apartment and the younger Michael had his nose broken. Interpol is passing the complaint to the Portuguese Police and the family has written to the club's management. Son Michael, a former Gillingham football player from Barming, near Maidstone, said: "I remember my mum being punched by one of the security guards. "I tried to help and calm things down. I remember being hit in the face with a big baton - I was hit several times round the body." His father Michael said: "I was lying on the floor after being beaten. As I came to, I saw my wife lying on the floor and someone kicking her. "Then I saw a big green van and the police came out of it. "I thought, that is good, we will be OK, this will stop. "They jumped out and started to beat me and kick my wife while she was on the floor. "I could not believe what was going on. "We are just a family, having a family holiday, going home after an evening out. "We were set upon for no reason whatsoever other than, we think, that we are English." Michael's girlfriend, Alex Day was also beaten about the ribs and kicked in the assault, the family said. 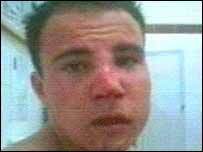 The younger Michael had to have an operation on his broken nose and also suffered a broken jaw. The company which manages the beach club said it does not own the resort but will see appropriate action is taken.